Lucky for us the sun did kick out, just on time as we were in the city celebrating our favorite band’s movie preview! Here is a quick fix of what Caitlyn and I wore to the Mistaken For Strangers screening in Los Angeles. 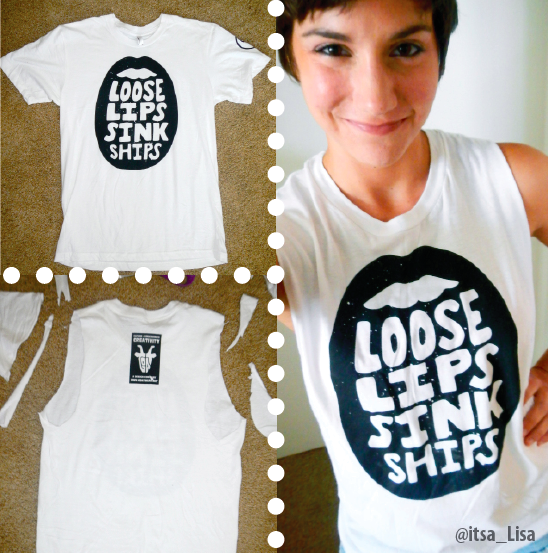 Here I am in my “Loose Lips Sink Ships” t-shirt, inspired by The National‘s song Cherry Tree. This shirt is fitting because Mistaken For Strangers is a movie about The National, and Cherry Tree is such a great song, and Loose Lips Sink Ships is such a great saying. In this shirt I can do no wrong. I’m also wearing a black blazer, denim shorts (cause it’s summer!) and suede booties. Caitlyn is wearing her favorite polka dot skirt, also with booties and a tank top. A cute get up for any long summers day of sight seeing and obsessing over our favorite band. To make this shirt more comfortable I cut the sleeves off. The art of cutting sleeves, as seen in my previous post “Rock Your Style” is in exposing the right amount of skin. If you just clipped your shirt down the sides, you would expose too much skin in the front, and not enough in the back. That is why I first cut off the sleeves along the stitch line, then I turn the shirt around and trim out the back, dipping lower and towards the center and work my way up. Once you have the shirt on you can stretch out the opening with your thumbs to give it a natural looking finish. And remember, this is your shirt – Rock it however you want! For more fresh updates on life and style, visit often! Or Click the images to repin them yourself!